The Good Things Guy joined forces with our client, OUTvest to encourage South Africans to share their good advice stories. This great publication promotes positive stories from inspiring South Africans who are making the world a better place. 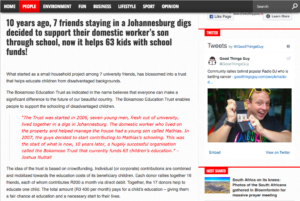 In the recent edition of GoodThingsGuy.com was a feature by our friends and partner, Bokamoso Education Trust. This great initiative is changing the course of lives of underprivileged youth through education – providing them with necessary financial support for an excellent education, as well as support through mentorship for each child. Giving our kids education is the best investment we can make and we are proud of Bokamo for the continious work they do to contribute to making a difference in our country. For more information, take a look at what you can do to become a donor. Podcasts are changing the way we engage with content and having started to unpack/understand them more as they are exploding all over the globe, I am amazed how many there actually are. Book to stay at Club Med’s Grand Massif resort between 18 – 24 August 2019 – as part of the special week they have planned for South Africans. Our South African national anthem, Nkosi Sikelel’ iAfrika, was named the best national anthem in the world by The Economist at the end of 2018. Our mates at Purple Group have released an impressive set of half year results following their strong financial results for the year ended 31 August 2018 which were released in November last year.